All the performance of the Coupé plus the extra exhilaration of open-air driving. 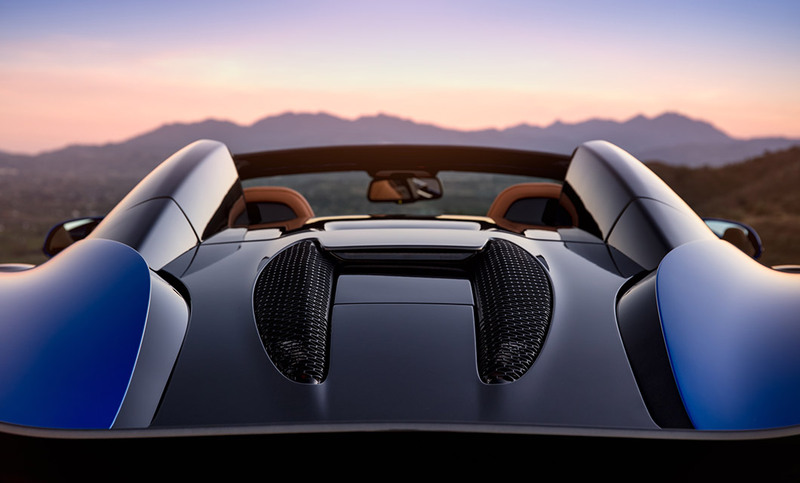 Discover the McLaren 570S Spider at McLaren Birmingham or McLaren Bristol. The team at Rybrook are dedicated to provide our customers with a professional, enjoyable, informative and tailored service whilst designing and building your new McLaren through to the maintenance and ownership experience. The McLaren 570S Spider has received excellent reviews across the Motor Industry and Motoring Journals such as Top Gear and Autocar. 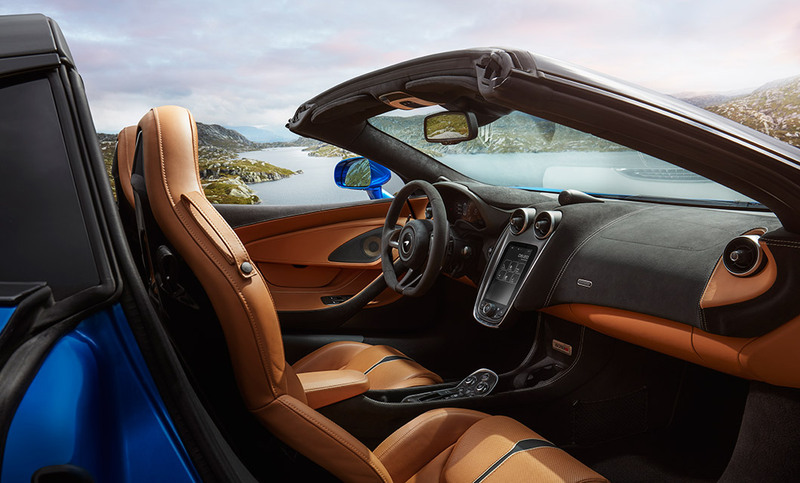 Enjoy the ultimate open-air driving experience, the McLaren 570S Spider features a retractable roof, which can be opened in 16 seconds whilst driving at speeds up to 25mph. The lightweight Carbon Fibre Construction and Mono-Cell II provides both safety and rigidity, aligning performance alongside the 570S coupe whether you choose to have the roof up or down. Dihedral doors provide a striking aesthetic as well as functional practicality when entering the car. The low centre of gravity ensures maximum performance and balance whether you are on road or track. The cockpit and luggage space are both ergonomic and functional, designed around you with an ease of use from the advanced touch screen to the audio. Designed to perform on road as well as track with aerodynamics enhanced for peak performance, the 570S features an active dynamics panel allowing the driver to optimise for any road condition. The powerful V8 3.8-litre engine has 562bhp and 600NM torque and combined with a 7-speed sequential shift gearbox delivers a top speed of 204mph and 0-62mph time of 3.2 seconds. Carbon Ceramic Brakes are standard on the McLaren 570S Spider to optimise for track performance. The McLaren Special Operations (MSO) bespoke range creates the ultimate tailored option for customers to create their unique specification through the MSO Bespoke & MSO Defined services. If you are looking to personalise your McLaren please ask the team for further information. Below are the technical specifications for the New McLaren 570S Spider. 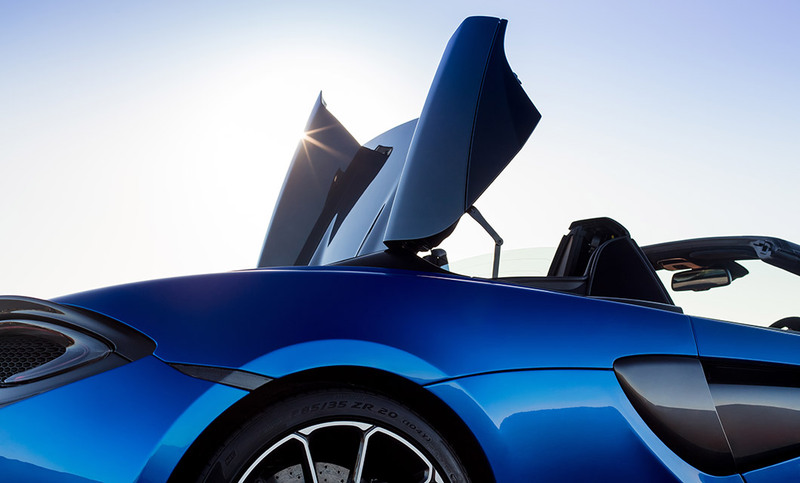 Interested in a New McLaren 570S Spider? 1. BE SURE YOU CAN AFFORD THE REPAYMENTS BEFORE ENTERING INTO A CREDIT AGREEMENT You are not obliged to obtain the services described under the Sales Agency agreement featured in the McLaren Personal Contract Purchase scheme. The Sales Agency agreement gives you the option to return the vehicle to Santander Consumer Finance at the end of the term. Selected Annual Mileage is 5000. Excess mileage will be charged at the rate of 14.9 pence per mile (plus VAT) for the first 5000 miles and at twice that rate thereafter. This representative example, available through Santander Consumer, is valid for 14 days from the date shown above. It does not commit the creditor to enter into an agreement with you and it is not an offer to sell the above or any other vehicle to you. Finance subject to status. Terms and conditions apply. Applicant must be 18 or over. Guarantees / indemnities may be required. At the end of the Personal Contract Purchase there are three options: (i) Part exchange the vehicle. (ii) Pay the GFV (Guaranteed Future Value) to own the vehicle or (iii) Return the vehicle. Further charges may be made subject to the condition of the vehicle. Santander Consumer Finance RH1 1SR. The personal information you have volunteered such as your name and address will be retained for the purpose of this quotation only and for a maximum of six months or until a contract of finance is executed. McLaren Birmingham and McLaren Bristol is a credit broker not a lender for this financial promotion. We can introduce you to a limited number of carefully selected finance providers and may receive a commission from them for the introduction. Advertised finance and terms and conditions are provided by Santander Consumer (UK) PLC t/a McLaren Financial Services, Santander House, 86 Station Road, Redhill, Surrey, RH1 1SR. www.santanderconsumer.co.uk On the road price is based on the manufacturer\'s recommended retail price and includes VAT, a 3 year manufacturer’s warranty, 12 months\' road fund licence, vehicle first registration fee and delivery. Terms and Conditions apply. At the end of the McLaren Personal Contract Purchase agreement there are 3 options: (i) Part exchange the vehicle. (ii) Pay the Optional Final Payment to own the vehicle or (iii) Return the vehicle. Further charges may be made subject to the condition or mileage of the vehicle. Finance subject to status, 18s or over. Guarantee may be required. McLaren Financial Services RH1 1SR. Channel islands excluded.